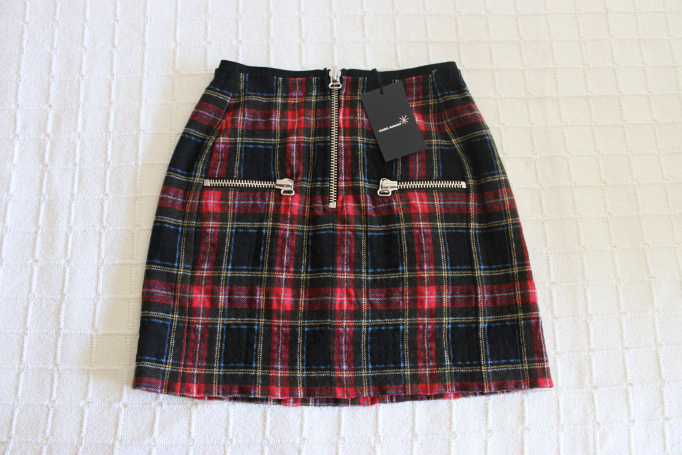 First fall purchase: school girl skirt by Isabel Marant. It was love at first sight! Here is a story: the sunglasses i’m wearing were my favorite pair last year, now I lost them (stupid me!) shopping and there wasn’t a day I didn’t miss them. They went back to my wish and shopping list until the lovely people from Cottet sent them to me! Now I am the happiest girl, I got back my much loved sunnies. Sunglasses are Ray-Ban courtesy of Cottet, t-shirt is Zara kids, skirt is Topshop clutch is vintage and flats are Chanel. Las gafas de sol que llevo fueron mis favoritas hace un año hasta que un mal día las perdí. Estaba de compras distraída y no se que fue de ellas pero desaparecieron. Desde entonces no paso un día que no pensara en ellas. Volvieron a estar en mi lista de “cosas que comprar” y “cosas que quiero”. Ahora las vuelvo a tener gracias a la gente de Cottet que me ha enviado mis muy queridas gafas! Os cuento que Cottet ha inaugurado tienda online con gran variedad de gafas para todos los gustos. También están en Twitter y Facebook. Relaxed, basic, classic, simple…all my favorite words when it comes to outfits! Sunglasses are Ray-ban, t-shirt is American Apparel, cardigan is Benetton, shorts are DVF, clutch is vintage and sneakers are Converse. This shorts are probably one of my best buys ever so I highly recommend you get yourself a similar pair. You can transition from summer to fall easily and it doesn’t stop there. You can wear them in winter with tights and very important…yes! they go from casual to formal in no time. Just wear them with heels and a blouse and voila! If you are looking for a similar pair you can find them here , here and here.